DURHAM, N.H. - Nicole Gifford (Ennismore, Ontario) scored three goals to record her first career hat trick and lift the University of New Hampshire women's ice hockey team to Saturday afternoon's 3-1 non-conference victory against Princeton University at the Whittemore Center. 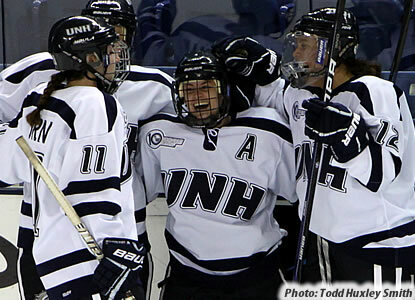 UNH improved to 5-9-2 overall and 38-5-2 lifetime against Princeton, which is now 4-7-1. Both teams entered the game with a five-game losing streak. Gifford, who did not have a multiple-goal game in 46 previous career games, also finished with a career-high three points with the three-goal performance. Maggie Hunt (Naperville, Ill.) recorded a personal best of two assists and Kristine Horn (Utica, Mich.) also tallied two assists to match her career high. Jenn Gilligan (Maple Ridge, British Columbia) recorded 24 saves, including 13 in the third period when the Wildcats were whistled for six minor penalties. Princeton counterpart Rachel Weber stopped 23 shots, including 10 in the first period. Princeton was whistled for a penalty 55 seconds into the game, but it was the shorthanded Tigers who nearly scored 35 seconds later on an odd-man rush, but Gilligan slid across the crease to stop Paula Romanchuk's one-timer at the left doorstep. The Tigers took a 1-0 lead at 7:40 when Charissa Stadnyk's shot from the right dashers was redirected by Sally Butler past Gilligan into the net. Olivia Mucha, who won control of the puck in the right corner and pushed the puck along the boards to Stadnyk, was also credited with an assist. UNH converted its third power-play opportunity of the first period into a goal to tie the score, 1-1, at 17:29. Hunt swung the puck from the high slot to Gifford and her screened shot from the inner-right circle sailed into the net. Horn initiated the sequence with a pass from the left corner to Hunt. The Wildcats also capitalized on their next power play to take a 2-1 lead at 9:06 of the second period. Horn moved the puck from the left circle back to Hunt, who quickly sent a pass to the slot and Gifford snapped a shot inside the right post for her second goal of the game. Gifford struck again at 11:55 to complete the hat trick and extend the advantage to 3-1. Brynja Bogan (Germantown, Md.) won the battle for the puck in the corner to Gilligan's right and chipped the puck forward to Gifford. She carried the puck through the neutral zone and her initial shot was stopped by Weber, but the rebound went to Gifford's stick and she lifted a backhander into the net. Princeton was whistled for another minor penalty with 11 seconds remaining in the second period. UNH controlled the ensuing faceoff to set up Hunt's hard wrister from the slot and Weber scurried to the left post off the rebound to also deny Arielle O'Neill (St. Catharines, Ontario). The Tigers went on their fourth power play of the game at 2:33 of the final frame, but Gilligan turned aside all three shots she faced in the next two minutes. After another successful kill that ended at 7:58, the 'Cats were whistled for two more penalties at 8:22 and 8:45 to give the visitors a two-skater advantage for 97 seconds. Princeton called time out at that point, but UNH's penalty kill limited the Tigers to two shots during the two-skater advantage - Gilligan denied Butler's one-timer from the left circle - and did not allow a shot in the remaining 23 seconds of the extended power-play opportunity. Princeton went on its fifth power play of the period - eighth of the game - at 12:08 and was able to sustain pressure, but Gilligan preserved the lead by stopping all five shots she faced during that successful penalty kill. Weber was pulled in favor of an extra skater with 1:57 remaining and UNH was sent to the penalty box with 45 seconds on the clock to give the visitors another extended two-skater advantage. The Wildcats' penalty kill did not yield a shot the rest of the way, however, to preserve the victory. UNH finished with a 26-25 shot advantage despite being outshot 13-4 in the third period, when the 'Cats were shorthanded for more than half the period (10 minutes, 46 seconds). The Wildcats were 2-for-6 on the power play, while Princeton did not score on nine power plays. New Hampshire continues its four-game homestand Nov. 29 against Union College. Game time at the Whittemore Center is 7 p.m. The homestand concludes Dec. 3 (2 p.m.) against Northeastern University; that game is part of UNH's annual Toy Drive.